The New Yorker has been a part of my life ever since I can remember. My parents, transplanted New Yorkers, have subscribed to it ever since they left The City in the early 70′s. As a child, I would look through it every week, trying to find the Nina’s in the Hirschfield drawings and trying to understand the jokes that studded most of the pages. As I got older, I would read the movie reviews and realized that if Pauline Kael actually liked something, you had to go see it asap. I learned that some of the best short fiction was published in those pages and some of the best writing in this country, period. When I moved into my first apartment after college, my mother’s housewarming gifts to me were a set of pots and a subscription to The New Yorker. That was in 1993 and I have been getting it ever since. Even in my dark days of exhaustion that comes with having newborn babies, I made every effort to read that magazine. I may not have read anything else for four years, but I was always more or less caught up with The New Yorker. OK. Corrupt me. I could not get that idea out of my head. In general the words “rice bowl” are intoxicating to me in the way that the word “chateaubriand” might be to someone else. I had to make this. But. I also had to change it, add to it. 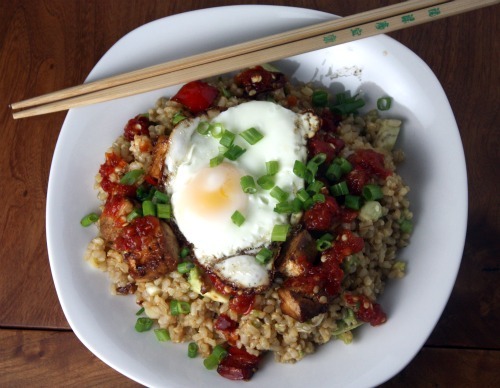 Make it more about the rice and less about the egg. As I started to create my version of the dish, I realized it was starting to look an awful lot like this rice bowl and so I went off in a slightly different direction. Here is what I ended up with. Brown rice studded with scallions, grated fresh ginger, sesame seeds, and avocado chunks. Tofu and red pepper marinated and baked in a mixture of tamari, sesame oil, sherry, and kecap manis (a sweet soy sauce). 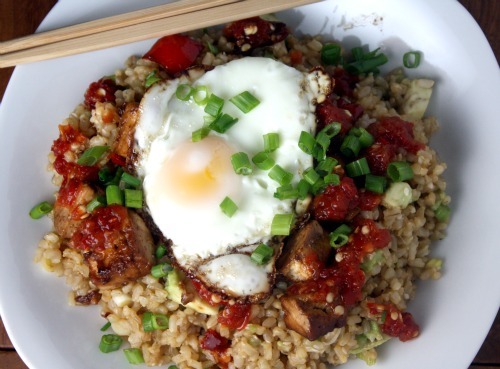 That sunny side-up egg is cooked in sesame oil like described and the whole thing is topped with a healthy dose of sweet chili sauce and all together it tasted nothing like the stuffings and mashed things of last week. In other words, it was awesome. In a medium baking dish, whisk together 2 tablespoons of the tamari, sesame oil, sherry, and kecap manis. Add the tofu and the red bell pepper and gently stir to coat all the pieces with the marinade. Allow to sit for at least half an hour and up to 8 hours. Cover and refrigerate if longer than 1 hour. Preheat the oven to 400ºF. Place the baking dish in the oven and bake, stirring occasionally, until almost all the marinade has been absorbed, about 40 minutes. Set aside. Bring a large pot of salted water to a boil. Add the rice and cook, keeping at a boil, until tender but with a slight bite, about 35 minutes. Taste often to make sure you don’t overcook it. Drain and allow to cool just slightly. In a bowl, combine the cooked rice with the remaining 1 tablespoon of tamari, the sesame seeds, grated ginger, the white and pale green part of the scallions, and the avocado. Use a rubber spatula to stir so that it doesn’t become too mushy. Heat a couple of tablespoons of sesame oil in a non-stick skillet over medium heat. Carefully break the eggs into the skillet, trying to make sure they don’t touch one another. Turn the heat to medium-low and cover. Cook until the whites of the egg are set but the yolk is still soft, about 5 minutes. Use a spatula to remove the eggs to a paper towel-lined plate. Place a portion of rice in a bowl. Top with pieces of the tofu and red pepper. Lay a fried egg on top. Garnish with the dark part of the scallions, chili paste, and more tamari to taste. I have been wanting to subscribe the the New Yorker for a while. I’ve been reading the cartoons (love Roz Chast!) in issues at my dad’s house for ever, but the articles are great too. I am looking forward to trying your brown rice cooking technique, its taken me too long to be able to cook a decent pot of brown rice. Yes! I’m another who’s not managed to read anything but the New Yorker since her baby was born (three years ago…well, there was also I Capture the Castle, which you absolutely must read if you haven’t already). I even read Tables for Two, even though I will never go to any of those restaurants, because sometimes the writing in those reviews is so lovely and jewel-like. It was a Sunday ritual trying to find all the “Nina’s” in the New York Sunday Times! You brought back memories! Yes! I just read this last night and was salivating over the description … loved the whole piece in general. Thanks for posting this! i still do that with the ny’er. i would be lost without my weekly read. i eat a lot of brown rice. can’t have soy :-( but i try my best to dress it up like this. looks good and hearty. The New Yorker is one of my favorites as well. I don’t subscribe I basically cheer for joy every time I see it in the doctor’s waiting room. Between the cartoons and the fiction…it’s just really good stuff. Somehow I’ve never come across the food issue, at least not since I’ve gotten into cooking, which seems kind of really tragic. I’m going to have to seek it out. Soon. 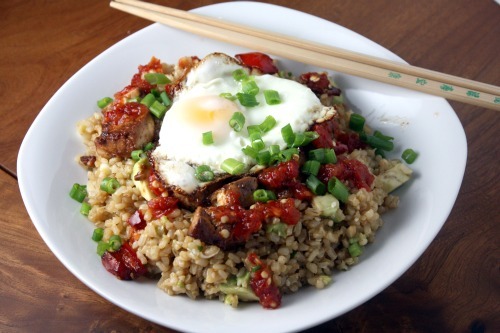 I love the sound of this brown rice dish! Simple and yet still substantial and full of flavor. You know, I’ve never thought to cook brown rice that way. I’ll have to give it a try! Looks like it’s one of those meals that you can show off your chopstick skills! :) This looks so yummy! I would love to read the New Yorker food issues. I’ve never seen it but I’m in Canada. That dish looks elegant. I thought the head photo was interesting, as it doesn’t look like a traditional ‘dana’ kind of meal-but I laughed as I read. I, too, am addicted to the new yorker, adored that article and made many a fried egg since reading. I’ve got a softening avocado in the fridge, some leftover grains and a dozen fresh, firm yolk eggs waiting to be my own bowl. This dish looks extremely tasty and reasonably easy to prepare. I love the idea of avocado in the Korean inspired recipe. It is very East-meets-West in a cool way. I bet that it was delicious. the only way I cook brown rice these days is in the oven, using a method I saw at Cook’s Illustrated – it takes more than 45 minutes, but I usually make a lot and saver for later. I will have to check out the food issue. I am familiar with “The New Yorker” but I have never read it. made this for dinner tonight. it was so good! I’ve never baked tofu before, I usually just fry it. baking is a great tasty and healthy alternative. would definitely recommend! thank you!